We’re wishing a very happy eighth birthday to Josie the giraffe. Our long-legged lovely was delivered a delicious bouquet from keeper Holly Clayton-Wright, first thing this morning consisting of her some of her favourite foliage! Staff make sure Josie, Kubwa and Kito are still able to tuck into leafy treats throughout autumn and winter by storing branches and leaves in airtight containers, which ensures they stay crisp and fresh out of season. 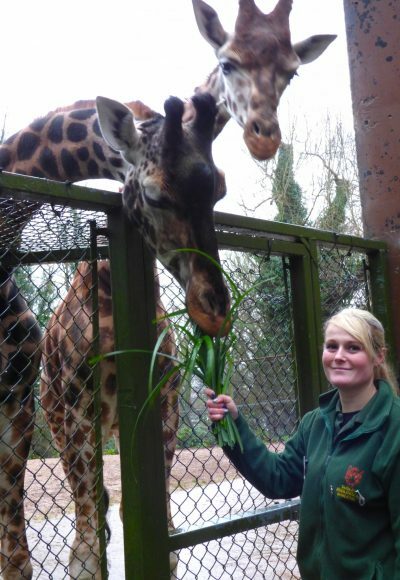 If you’d like to buy Josie a birthday present off our Amazon Wishlist then karabiners or 30 litre plastic storage tubs would be particularly useful for the giraffes. Come and learn more about our giraffes – recently recategorised as vulnerable on the IUCN Red List – during our daily talk and feed, at 12.45pm at the giraffe paddock.